Today, I'd like to introduce another Messy Beader, porcelain artist Marsha Hedrick. Some of you might know Marsha's gorgeous work from her website, Amazing Porcelain Fantasies. I was introduced to her work through her artist beads that were sold through the Beadin' Path of Maine. "That is the dining room table, where I assemble things ( when I actually get a chance to assemble) and where I take pictures and collect things for orders. 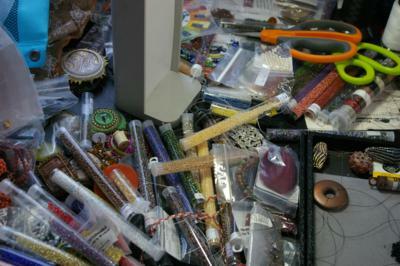 I have most of my seed beads in some boxes and a little toolbox. I also have some little tilt out things that I keep wire and various other supplies in. All of my porcelain beads (stock) are in trays in a case. Finished Jewelry is in another case just like the one the porcelain beads are in. Then there is some more finished pieces that are in jewelry boxes in a larger box. Those are all sort of next to the dining room table on the floor or in a chair. This is somewhat complicated by the fact that I do Native American Shows and other shows. The Native American pottery and jewelry is in a big box on a cart. "I do periodically clean it all off, but it never stays cleaned off for long. I suppose I do feel like I accomplished something when I clean it off, but it is one of those things that just doesn't stay last for long. Usually it is a mess again the same day. "I would love to be a bit more organized and I hope to accomplish it soon, although I doubt it will ever be really clean and neat as I'm just not that sort of person. I am organized, it just isn't obvious to the casual observer. 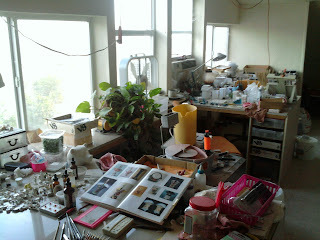 I have an area in my studio that is designated for this mess. When that area is done the majority of this stuff will move over there and it will be much more organized. It is a larger area and I can compartmentalize so there is a place for photos and a place for assembly, etc. This will help enormously. At least the messes will be all belonging to the same activity. "In the studio I have areas that are devoted to various tasks and all the tools for that task remain there. It can still get messy but not like this table. I do so many things that some areas are devoted to several tasks and when I change from one to the other I will clean up the area and put away all the tools from the previous task and get ready to do the new task by getting out the things for it. I suppose that sort of clears the head and gets me in the mood for the new activity as well although sometimes it seems to take forever to get to the new activity which I wanted to be doing already. "What mostly affects my productivity is not being able to find a given tool or product. Lots of times this is because it is in the studio and I'm in the house or visa versa. Again this should be better when I get it all in my studio. Searching for an item I need to complete something drives me crazy. I spent nearly 4 hours one day digging out the things I needed to assemble a little tray that I hadn't made one like since I moved out here. In the end it may have taken 15- 20 minutes to assemble the tray. This is what aggravates me. "My brain is organized to remember where I had something last and it usually works pretty well for locating things but sometimes it breaks down in the data recovery stage. I think as I get older that organization may become more important because the brain doesn't remember as well as it used to. I think it is filling up a bit or perhaps trying to use the pathways that got burned out when I was young and even crazier than I am now." You can see more of Marsha's work on her website, Amazing Porcelain. Her work is also for sale on her Etsy Shop, Amazing Porcelain Fantasies. Marsha also has a blog you can follow, Marsha's Porcelain Art. If you'd like to be one of our featured Messy Beaders, just click on the tab at the top of this page, answer a few simple questions and email it in with a photo of your messy (or not so messy) beading area!